In my church all of the service positions are volunteer. Several months ago I was asked to serve as the Cub Scout Committee Chair. I accepted and then freaked a bit as I know nothing about Cub Scouts. Luckily with some training and help I have settled in pretty well and this last month helped plan the Blue and Gold Banquet. 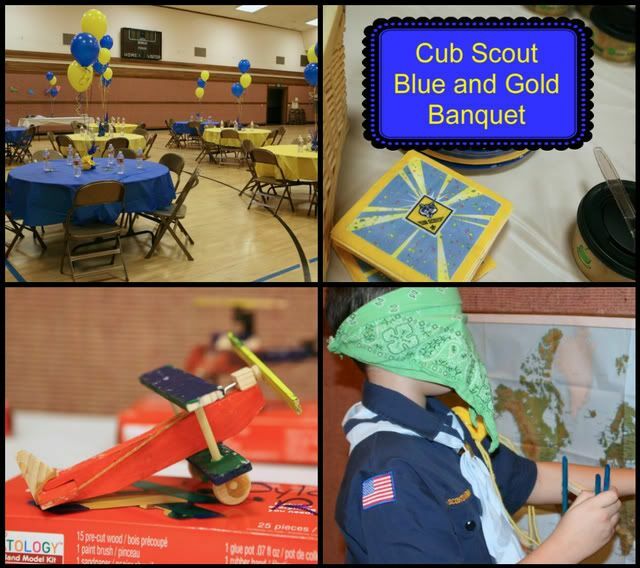 Our Blue and Gold Banquet was an aviator theme. As the families arrived the boys played pin the plane on the map. The boys made the planes during a den meeting earlier in the month. Before the game was played, the planes were part of the table decor. 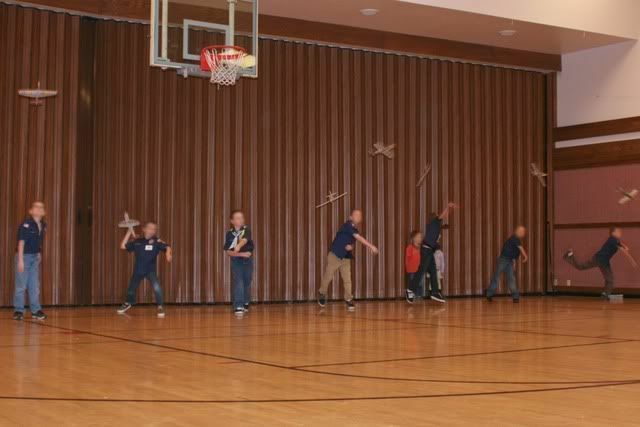 Part of the decor also included the little planes and helicopters the boys had painted during an earlier den meeting. We then did the flag ceremony and the boys were given their awards they had earned. Then we had dinner. We took the easy route and did a couple of platters of Subway subs, some salads, individual bags of chips and bottled water. At the end we had cake for dessert, I made the cake. While everyone was finishing eating, the scouts were given some glider plane kits (purchased from Oriental trading). They put them together with the help of their families and then had a race to see who's would go the furthest. The boys then had their box-plane "race". 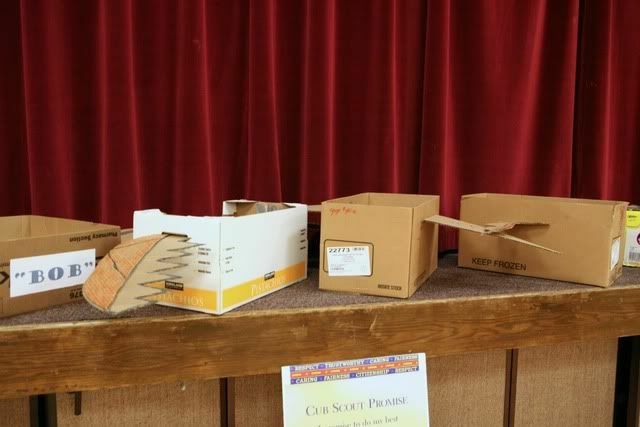 The month before, during scouts the boys learned about planes, how they work, different types of fighter planes from different eras and then they made their box planes. They each modeled them after a different World War Era fighter plane and all chose a call name. 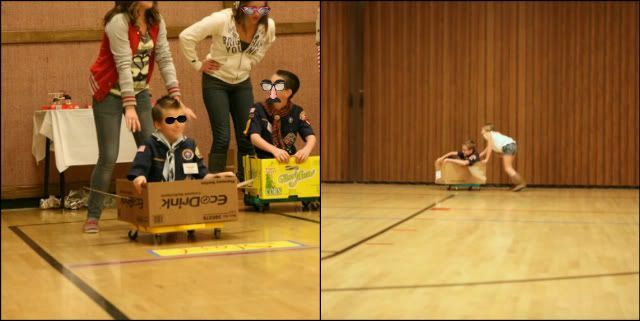 We placed the box on one of those square four wheel scooters and the Cub Master announced each boy, by their call name, told about their plane and what plane it was built after and then a family member quickly pushed the cub scout riding in his plane around the track. Everyone loved it. There was a paper airplane station set up, with paper and instructions so anyone could build paper airplanes throughout the night. We ended the night with cake. It was a great successful event that everyone seemed to really enjoy. Now we just have to prepare for the pinewood Derby next month. Have you ever been involved in any type of scouts? Great job with the banquet and the cake. So cute! That looks like it was a fun night. The cake you made was gorgeous! You did an awesome job! Wow you did a great job! Looks like the boys had a great time! Wow Em...you really outdid yourself. The cake was so wonderful and it looks like the night was fun for all! Glad Lucas could be part of this group. That looks like it was so much fun! Great job with that! My son just started Tiger Cubs this year through the school. I haven't been too involved yet, but that will probably change in future years since I have sons! I love the friendly competitions they had! So neat! We always did pizza or something similar at our banquets too. Way less work! Blue and Gold as in that delish sausage that they sell? Or is that a school fundraiser that sells that stuff? Anyway, by the looks of those pictures, fun was had by all and that cake looks too pretty to eat (but I would have cut right into it if I was there). How fun! Looks like you did great! I have to say, this is a calling I have never wanted, but you made it look so great! Fun! And are you going to possibly still be in when Lucas joins this fall? That would be crazy and fun! I know nothing about scouts either, but it looks like they had a great time! I haven't been, but my mom was for about two years when she first moved out here. Hard to believe Lucas is going to be in Scouts in the fall and Ryan next year! The whole night looks awesome. You did good. My husband was Cub Master for awhile. And my primary presidency position has me over cub scouts. Plus my son is a scout and Hubby has gone on every scout camp with him. So I would say we are pretty dang involved! It is rewarding and at the same time annoying sometimes...haha, but it is a good program. With 3 boys I have been up to my ears in scouts for years but I totally LOVE scouts and believe in the program soooo much! This year was the first year in - I don't know how long - that we don't have a cub scout so no blue and gold for us anymore. You did a fantastic job with this one!! I love the aviator theme and all the activities! Your ward is so lucky to have someone so enthusiastic! I've been to 4 Blue and Gold banquets and yours is by far the best I've seen! Ours are soooooo boring. Wow, what a great party! The cake was beautiful! 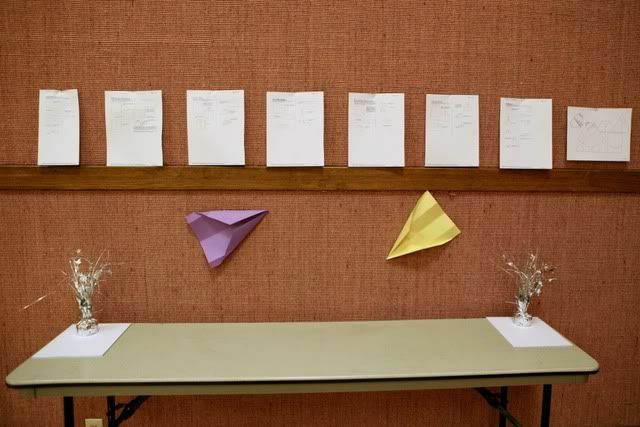 So clever to have the art project (airplanes) later become the decor for the party! I think I would feel very lost if I was called to scouting! Everything you did looked great. You really magnified your calling for sure! You did an amazing job with the banquet! I love all of those activities you had planned! That box plane game looks awesome!! 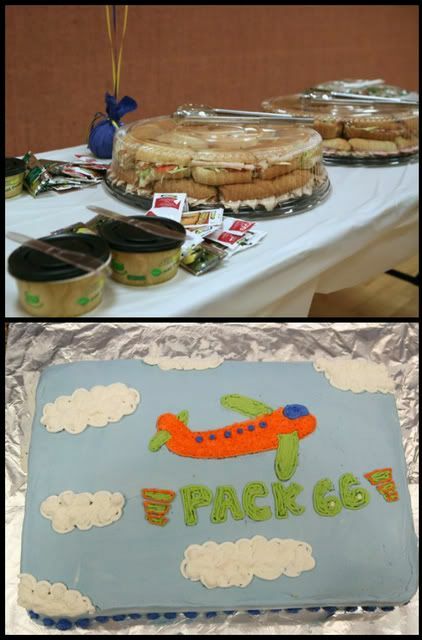 Great job on the cake and decorations! Henry just joined the scouts and honestly, my husband has been doing the work for it, lol. You did a fabulous job with it, the theme was just perfect and I'm sure the boys all loved it. Where did you get the wooden planes in the red box? I love this idea for our Blue & Gold banquet. One of the other leaders picked them up, so I am not sure, tried to find the pictures to see if I could see more of box, I believe they were at Michaels though.